Regardless of which option you choose, the ultimate goal is to isolate the variable x (or whatever it happens to be) and solve for it. When you’re taking the test, you can click “Formula Sheet” in the upper-left corner of the screen to access a pop-up window that contains the quadratic formula. 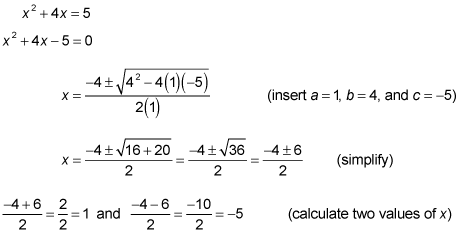 The following practice questions ask you to solve in two ways: by factoring the quadratic and by using the quadratic formula. Solve for x in the equation x2 – 5x + 6. Solve for x in the equation x2 + 4x = 5. The solution is (3, 2). The two values of x that make the left side of the equation equal to 0 are 3 and 2, commonly presented as (3, 2). The solution is (1, –5).